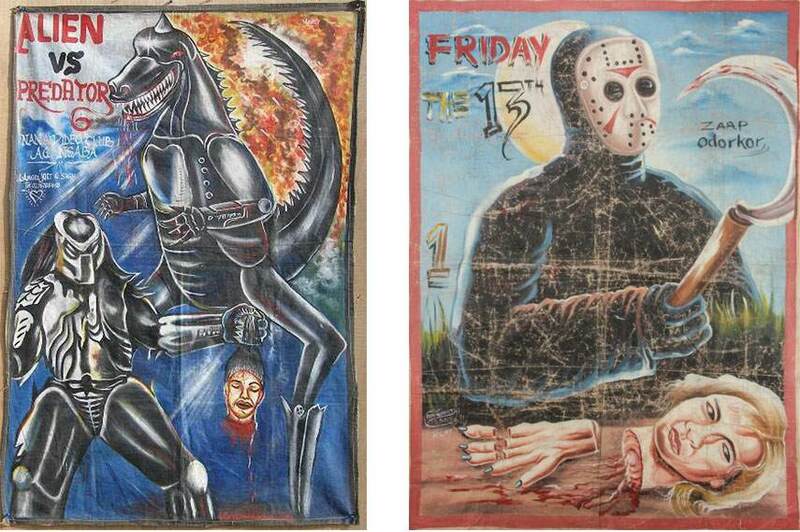 Ghanaian Movie Posters Emanate the Joy of Bizarre Art - and they're Highly Collectable, too! 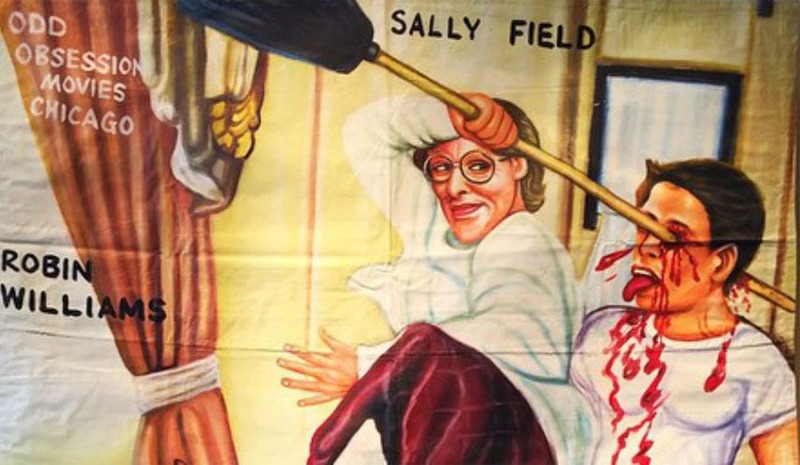 Come with us into the world of Ghanaian movie posters! Lately, they turned out to be all the rage and the perfect fit for thrill-seeking movie and art lovers. And you’ll show them off more than you usually would do with a similar item. That’s right. Although hanging movie posters on your wall sounds like something we used to do in high school, having a movie poster from Ghana is something different. The modern movie posters look boring anyway. Ever since the Hollywood colorists have discovered the omnipotent combination of orange and blue, every modern movie poster looks kind of similar and indistinguishable from dozens of others. And while Hollywood ones tend to leave a lot to be desired, the Ghanaian versions bring you craft and unique approach that often has something to do with exaggeration, either through depictions graphic violence of purely associative compositions. The story begins in the eighties. Outside of major cities in Ghana, cinemas were rare. Some smaller towns and villages still didn’t even have the electricity, so setting up a movie theater was pretty impossible. Eventually, thanks to the rise in popularity of video cassette recorders, rural Ghana saw an emergence of mobile cinemas. Equipped with VCRs, diesel generators and larger TV sets or projectors of sorts, savvy businesspeople toured Ghana showing movies where they couldn’t be shown. On their way, they hired local artists to paint the posters for those movies. So bootleg cinemas had their own bootleg movie posters. The aim of the posters was to purposefully exaggerate, grab attention of potential viewers and set their expectations high. After all, the business had to be profitable (so the exaggeration was sometimes pretty excessive), and the practice of hand painting movie posters continued well into the 90s. But, why hand painted posters in the age of VCRs and portable generators? During the seventies and the eighties Ghanaian laws forbade importation of large printing presses, so in Ghana it was a common thing to hand-paint everything – from posters to commercial sings and signage by the road. The movie posters from Ghana combine several visual languages at once. 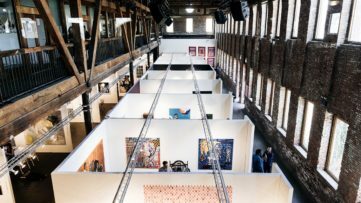 They belong to contemporary African art and, at the same time, show us an art that had a chance to develop in a rather unique climate. They are a form of pop art, but they’re oddly authentic. 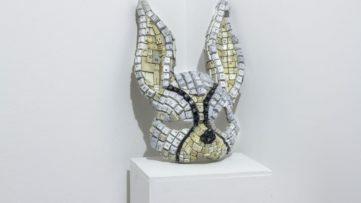 What makes them unique is the interpretation: while relying and using the known motifs from a movie, artists created their own artworks. They exhibited a vast attention to detail, and as a result of that, painting movie posters was never profitable. It did, however, become a movement in contemporary Ghanaian art. 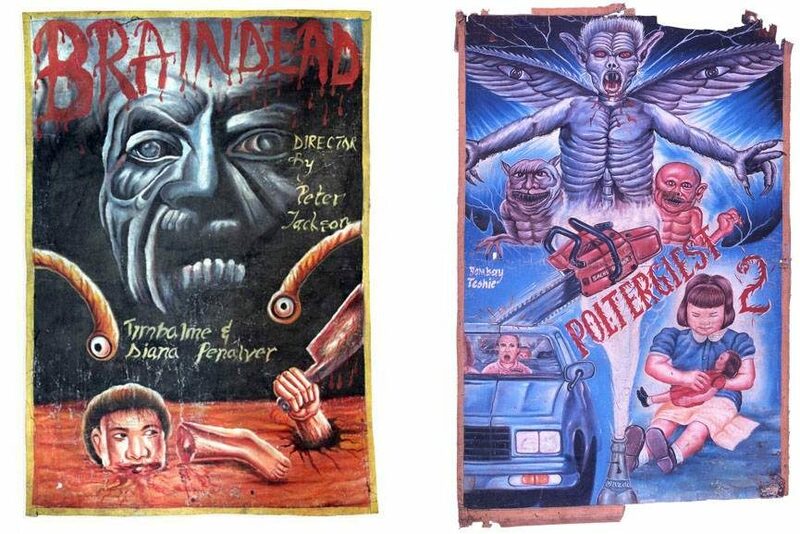 Ghanaian movie posters are painted by hand, on a piece of canvas that’s usually made out of flour sacks. They say that the perfect poster size would be made by sewing two canvas sacks together. That kind of a DIY quality corresponded to the whole bootleg cinema phenomenon. The artists, who often signed their posters as they would do with regular artwork, used that canvas to create cinematic, imagination-driven and hugely interpretive paintings. Every artist brought their own distinctive touch to each movie they had the task to promote. And all of them made the movies way gorier than they actually were. Although the posters were made pretty durable, the extensiveness of their usage made them appear older than they are. If you get an authentic poster from some 20 years ago, it will probably look way older. But that’s a part of their charm. 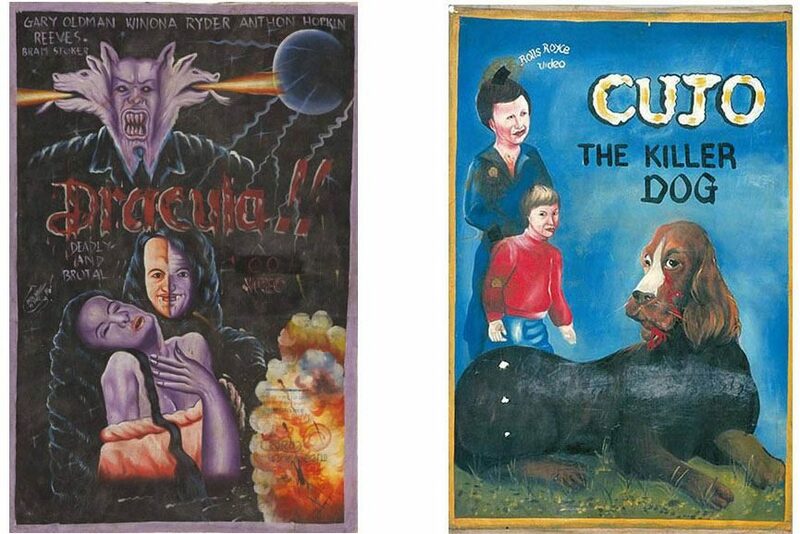 If the Ghanaian movie posters have little in common with their Hollywood paragons, it’s because the artists who painted them didn’t even see the original movie posters. They often painted posters not having seen the movies they were for. The quality of a poster, therefore, depended on the way the movie was retold to an artist. The recent interest in Ghanaian movie posters, sparking the entrepreneurial spirit of Ghana’s artists, is happening in the age of internet. Today, the artists don’t have to imagine everything by themselves. If you order a poster from your favorite Ghanaian artist, chances are that they’ll look for the inspiration online. 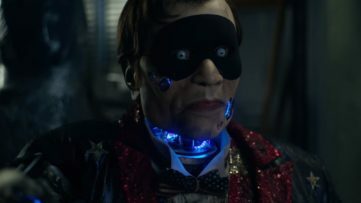 Don’t be worried – all the features of the movement are there, and knowing what a movie is about is actually quite likely to lead to an even wackier interpretation of it. Just look at this custom made Mrs. Doubtfire poster commissioned by a video store in Chicago! Many collectors like posters. So, if you want a poster of your favorite movie on your wall (but don’t like the original or just think that would be too trivial), here’s a tip: order a hand-painted version of it from Ghana! Yes, you read that right. You’ll always get something to admire: if you’re not interested in the traditional craft, you’ll have a quirky and sometimes unexpected reading of a famous movie title. 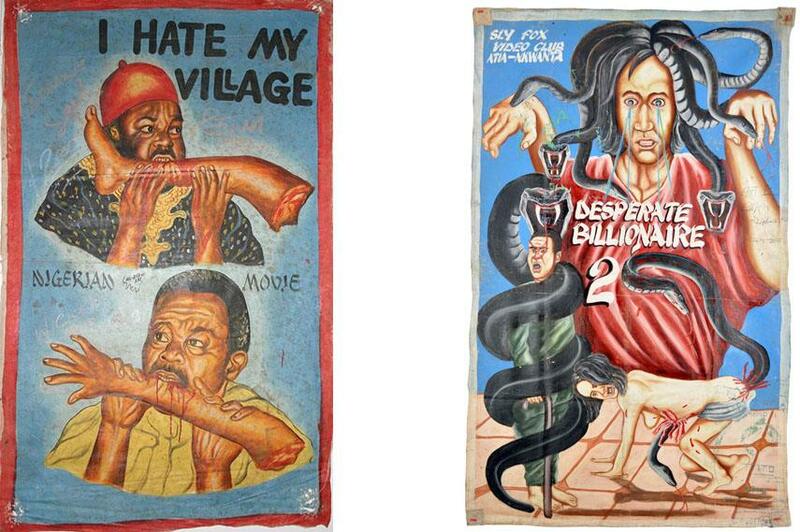 The Ghanaian movie posters have made their way to museums, galleries and private collections. The world wide web has sparked a new interest in them, and commissioning them is easier than ever. But, be careful: every artist has their own distinct style. Like in any other kind of art, “just any” artist or poster wouldn’t do. 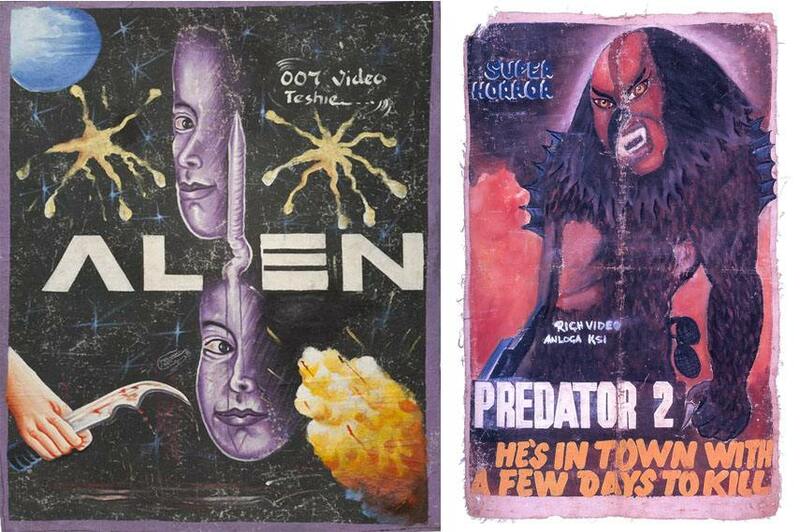 A hand-painted movie poster from Ghana will, however, always be fun. Although the art world these days is all about printed releases, hand-painted works on flour sacks remain desirable. It’s interesting to see a poster detached simultaneously from the movie it represents, from its target audience, and from its intended usage, which, to be honest, never really required so detailed and authentic work. Ghanian art, as well as African art in general, is quite marginalized on art market (who whould actually think about Ghanian movie posters, right?). There are artists, such as El Anatsui who managed to enter the market, however, there are many artists who cannot manage to become visible to the global contemporary art scene. There is a mispercepetion that Ghanian art, like African art in general, is traditional and coservative. However, this is not true. There are a lot of amazing contemporary artists whose work and practice can be compared with „Western“ artists. Unfortunately, political and economic situation also influences the position of artists, and disable them to become more visible in the global scene. 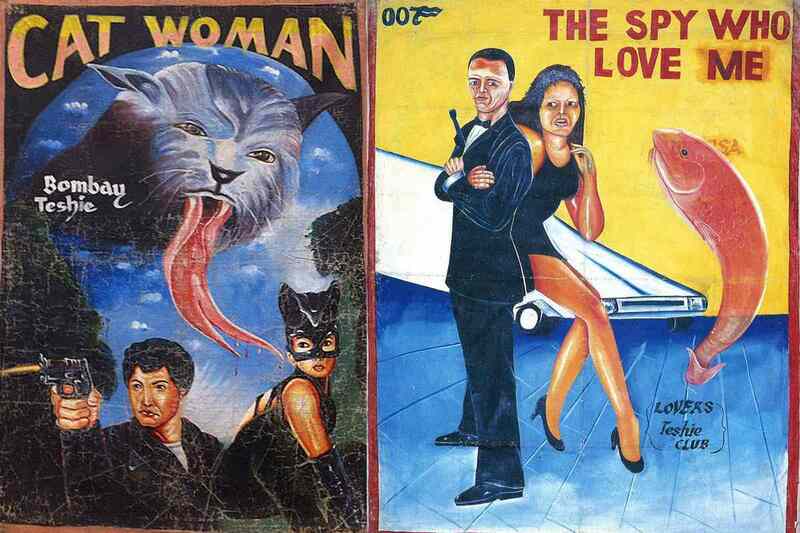 Featured images – Ghanaian movie posters: Left: Catwoman, via Awesome Robo / Right: The Spy Who Loved Me, via Openculture; Left: Braindead, via CVLTnation / Right: Poltegreist 2, via Monsterbrains; Left: Dracula, via Thumbpress / Right: Cujo, via Thumbpress. All images for illustrative purposes only.